We’ve had a good time here – we’ve been able to relax as well as make repairs to the boat. Many people have ex’s that live in Texas, well mine lives in Ft Myers. We got together early Saturday and she was nice enough to lend us a car while we’ve been in town. Something I learned, it’s not a good idea to have a current and ex wife meet, because if they get along as Roberta and the ex do they have one thing in common to talk about and that’s me. Saturday I also studied up on the problem of how to change the fuel injector pump. The first problem was there are two different models of pumps – an easy one to change and a hard one to change and of course I had the hard one. The books I have were not very encouraging and by early afternoon I decided I had studied the problem enough and it was time to go shopping. Sounds like a woman thing, but it was too hot and I didn’t think I could complete the job in a day and we needed some stuff from West Marine. There are two West Marine stores about 5 miles apart. We went to the closest one and found one of the five things on the list so on to the next one. One of the things I wanted to do was to find a Walker Bay phone number I could call about my deflate-able dink. I got the Walker bay number plus the number of a guy that sold/repaired inflatable boats. We called the guy and he was one of those people who believed in customer service. He was closed when we called but took our call and said he would fix it on Monday and that I should call Monday at 8:30 which I did. He said he would be at the dinky dock where we are moored at 9:15 – he was a couple of minutes early. We loaded the dink on a trailer and he said he would be back by 11:30. At 11:15 he called to say he was on his way and arrived within a couple of minutes of 11:30 with the repaired boat. So far it seems to be holding air. On Sunday it was time to tackle the fuel injector pump problem. Starting the project my confidence was 60-40. Sometimes 60% confident it would work and sometimes just 40%. I pressed on because I figured I could always put the old one back on if the new one didn’t work. My concern was that the fuel needs to be added to the cylinder at just the right time and the fuel injector pump can be rotated left and right slightly to adjust the fuel delivery time. The manual referred to lining up marks on the pump and engine block – well there were none. All I could do is mark where the old one was and install the new one in the same place. I started about 8 AM and finished around 3 PM and then it was time for the moment of truth. We cranked the engine several times without luck. I checked to make sure all the air was out of the system and just as I was about to give up the engine started. No leaks, the engine sounded smooth-another win. If it hadn’t started I already had a lead on a guy to help. Monday after the dink was fixed it was time to play. 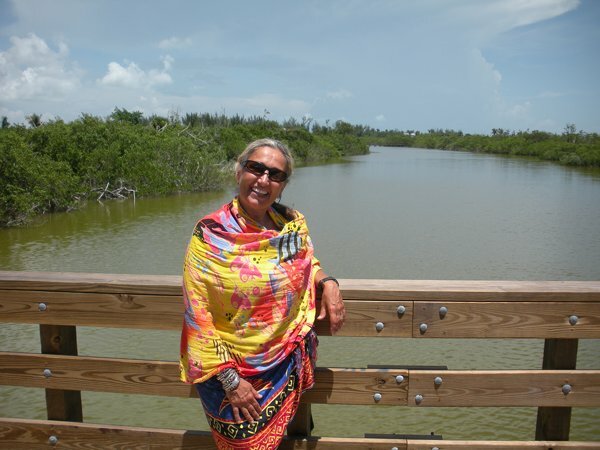 We went out to Sanibel and Captivia Islands. This is the home of some high dollar homes and beautiful beaches. We walked out to one and we had to walk over this bridge to get to it. Tomorrow we leave for the Dry Tortugas.